U.S. fears about China and Russia's growing influence in Central Europe will top Secretary of State Mike Pompeo's agenda as he heads to the region this week, Trump administration officials say. Pompeo leaves Sunday on a five-nation tour of Europe that will begin in Hungary and Slovakia where he will raise those concerns and the importance of promoting democracy and the rule of law to counter Beijing and Moscow's efforts to pull the countries away from the West and sow divisions in the European Union and NATO. The centerpiece of the trip will be a conference on the future of the Middle East in Poland on Wednesday and Thursday that is expected to focus on Iran and will also be attended by Israeli Prime Minister Benjamin Netanyahu, Vice President Mike Pence and President Donald Trump's Mideast peace team of senior adviser and son-in-law Jared Kushner and special envoy for international negotiations Jason Greenblatt. But in Budapest and Bratislava on Monday and Tuesday, Pompeo will specifically point to issues related to Central Europe's reliance on Russian energy and the presence of the Chinese high-tech telecom firm Huawei, particularly in Hungary, according to the officials, who were not authorized to publicly discuss Pompeo's travel and spoke on condition of anonymity. U.S. officials are deeply troubled by Huawei's expansion, especially in NATO member states where they believe it poses significant information security threats. The officials said Pompeo hoped to reverse what they called a decade of U.S. disengagement in Central Europe that created a vacuum that Russia and China have exploited. Over the course of the past 10 years, the officials said Russian President Vladimir Putin and Chinese leaders have become much more aggressive in the region and making inroads. One official said Pompeo would "look for areas of shared interest that have been neglected in the recent past" in order to "wrong-foot the West's rivals in places where they have gained bridgeheads." The administration has made a point of reaching out to Hungary's nationalist Prime Minister Victor Orban, who shares Trump's strong stance on limiting migration and has adopted increasingly authoritarian measures, including cracking down on the opposition, labor unions, independent media and academia. The Obama administration had largely steered clear of Orban, who won a third consecutive term last year in a campaign based on anti-immigration policies and whose policies have been met with street protests and deepening concern within the EU. Last month, Orban said he wanted "anti-immigration forces" to become a majority in all European Union institutions, including its Parliament and the EU's executive Commission and predicted that there would soon be two civilizations in Europe — one "that builds its future on a mixed Islamic and Christian coexistence" and another in Central Europe that would be only Christian. 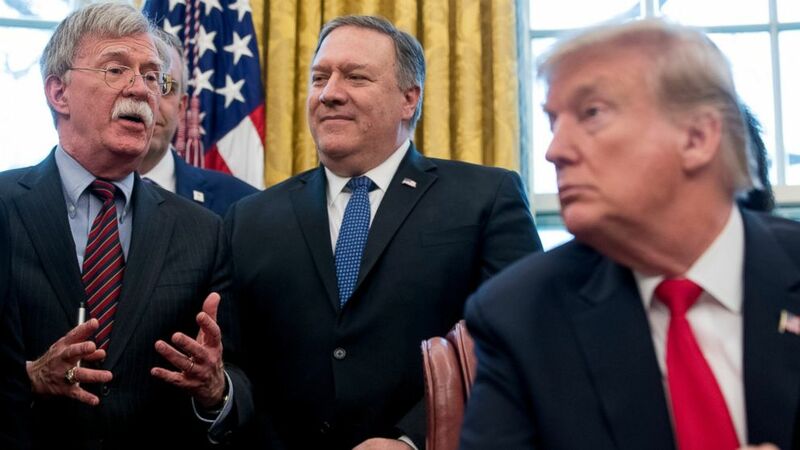 "Secretary Pompeo needs to treat this trip not as a friendly meeting between allies, but as an opportunity to have a frank conversation with a state increasingly at odds with both American interests and its human rights obligations," Human Rights First said in a statement. "At the same time that he's rolling back Hungary's post-Cold War democratic gains, Orban is making increasingly clear where his strategic affinities lie by cozying up to the Kremlin." The U.S. officials defended the Budapest stop, saying it is impossible to press the U.S. positions and interests in Hungary effectively without meeting Orban. "We have to show up or expect to lose," one official said. The official added that the administration has seen "the results of lack of U.S. engagement in the region" and "we want to step up that diplomatic engagement." The official also noted that Putin had visited Hungary twice last year and that Pompeo would meet civic leaders, some of whom have been critical of Orban. In Bratislava, Pompeo will meet Slovak officials on similar issues and also to pay his respects to the hundreds of people who died attempting to escape from the communist former Czechoslovakia to Austria during the Cold War, the officials said. In addition, the State Department said Pompeo will also address students about the importance of "the legacy of Western democratic freedom and its triumph over Communism." After the Mideast conference in Warsaw, Pompeo will wrap up his trip with brief stops in Brussels and Rekjaivik, Iceland, on Friday.